Here goes another drugstore/beauty supply product review, well first impressions in this case. Product Claims: This curling cream will define, condition and add manageability to your curls, leaving them soft, shiny and deeply moisturized. 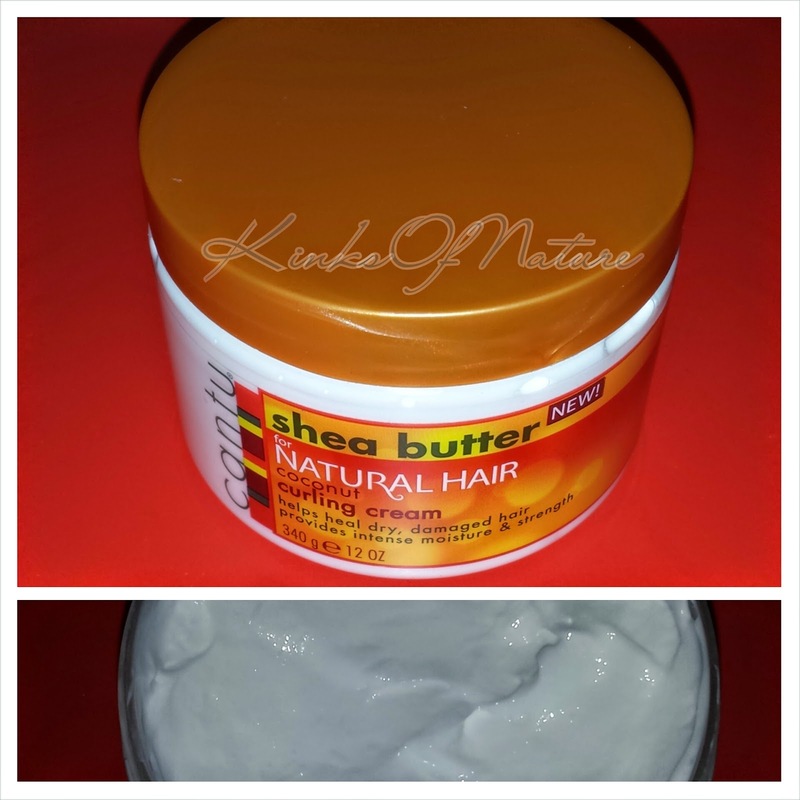 Made with 100% pure shea butter and formulated without chemicals or harsh ingredients. Thoughts: First off, I love the way this smells, like pina colada goodness! I tried it as a styler on its own, but I could see that it didn't have enough hold while applying so I added some Fruit of the Earth Aloe Vera Gel on top. My hair is extremely soft and light. It's not as defined as I like, and I'll probably only get a couple days wear out of this, but it will do. I was concerned about the petrolatum, but my hair doesn't feel coated or dry right now. Even on the second day it was still soft and moisturized. I had decent enough definition to wear my hair out the second day, but I ended up pulling it back into a bun. The heat was just too much. Next, I'll try it under a harder hold gel. It's not going to work for me as a wash and go styler, but I can use it as a leave in and possibly a moisturizer. I might try it for twists or braids, but that's not really my thing at the moment. Cantu Shea Butter for Natural Hair Coconut Curling Cream is available in 12oz and retails for about £5 in the UK and $6 in the USA. I think it's in the $10+ range in The Bahamas, but I'm not certain. I'll post a full review in the coming weeks. I don't usually combine reviews but thought it would be fitting for As I Am's Curling Jelly and Smoothing Gel. The Curling Jelly is too light for me to use on wash and go's, but the Smoothing Gel is great and also works for smoothing my edges and creating sleek buns. Product Claims: What a wonderful Curling Jelly for hi-definition coils and curls, with buoyancy and vibrancy! Whatever your hair length, your style will be distinctly beautiful and will hold its definition for days. I've taken a break from posting and social media to just deal with life and all of its wonderful ups and downs. However, blogging has always been a bit of a release, so I'm trying to get back into it. It also helped to finally get rid of the empties I've been hoarding for a few months now! I don't have many empties on the hair front because I've been wearing braids for months. I finally switched back to my natural hair about a month ago. Time to give my edges a break, I thought, but then Beyonce came through with Beychella and snatched them out! Camille Rose Algae Renew Deep Conditioner: Check out my full review here. This has been an HG product for years and still going strong! Curl Junkie Repair Me! Reconstructive Hair Treatment: I love this! Too bad it's not carried in the UK anymore. I might pick up some during Black Friday sales. Earlier this month, Uncle Funky's Daughter (UFD) restocked their Curly Magic Curl Stimulator after it was unavailable for weeks. This restocking surprisingly came coupled with a formula change. Check out the new ingredients list below along with a statement from UFD regarding the change. OLD Ingredients: Organic Aloe Vera Juice, Aqueous-Infused Extracts of Marshmallow, Chamomile, Nettle, Horsetail, Vitamin E, Agave Nectar Extract, Citric Acid, Potassium Sorbate and Natural Fragrance. Excerpt from UFD's Facebook announcement: "We finally have all the curl enhancing power you are looking for, in our improved moisturizing Curly Magic. The hold is the same firm hold you love, but hair feels softer, more nourished, while the fresh scent is very mild and clean."